Flowers in a White Vase by Scottish artist Anne Redpath is estimated at £4000-6000 In Olympia Auctions’ April 17 sale. One of the market-fresh British Railways advertising posters stored for many years in a cupboard on offer at Lindsay Burns on April 16-17 estimated at £80-120 each. A group of market-fresh British Railways advertising posters stored for many years in a cupboard have been consigned to Perth saleroom Lindsay Burns. Estimated at £80-120 each in a two-day sale on April 16-17, the eight-lot group promote a variety of destinations such as Bognor Regis, Cheltenham Spa, Loch Awe, The Lake District. 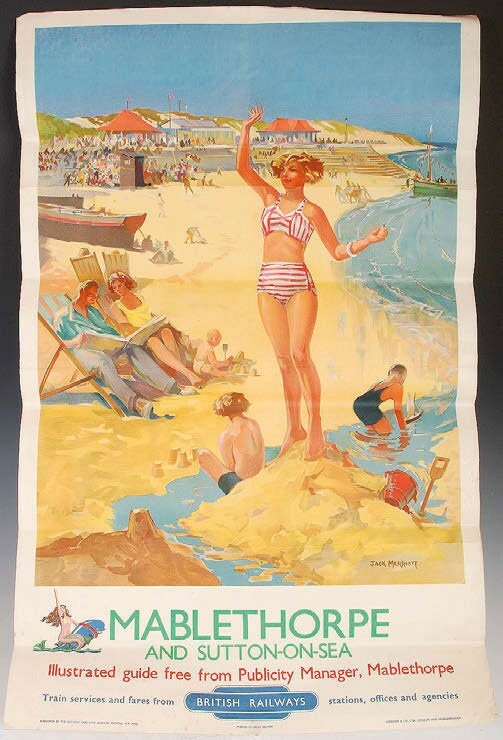 This 3ft 4in x 2ft 1in (1.02m x 63.5cm) design is for Mablethorpe and Sutton-on-Sea. The posters were assembled by the vendor’s grandfather who worked as a clerk at the railway station in Southport during the 1950s. View the auction online at thesaleroom.com. 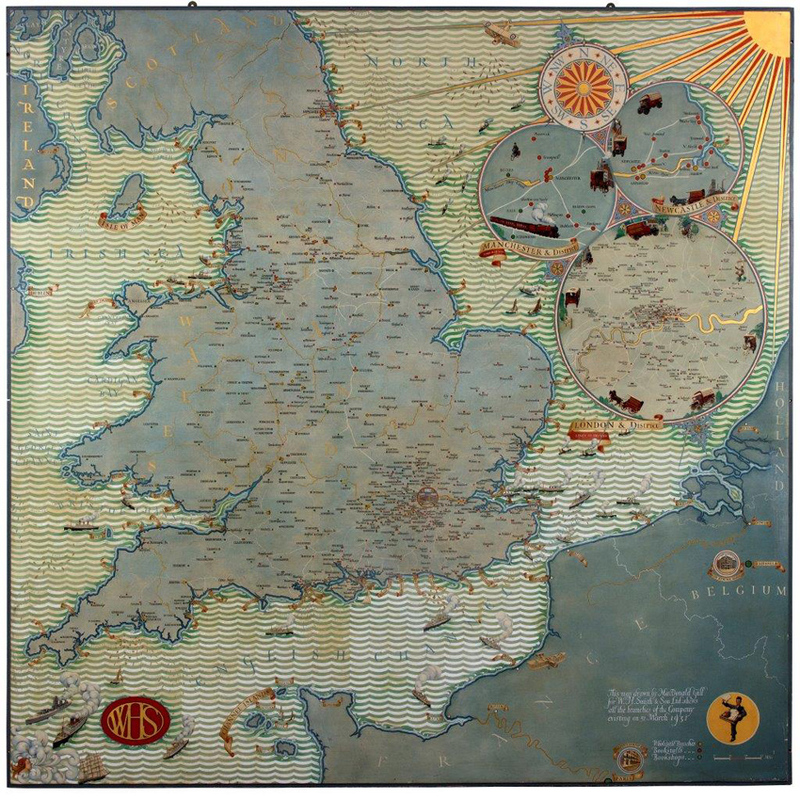 A rare map of Britain by MacDonald Gill (1884-1947) and lettering for signs by artist Eric Gill (1882-1940) are among the lots coming up at auction from a WH Smith archive being offered at Chorley’s modern art and design sale on April 16 at Prinknash Abbey Park, Gloucestershire. Consigned by The WH Smith Archive, among the lots is MacDonald Gill’s scale map of Britain and Northern Europe featuring the locations of Smith shops and branches which had been made for the company’s boardroom. It is estimated at £20,000-30,000. View the auction online at thesaleroom.com. This 19th century ‘bone shaker’ bicycle of metal construction with a padded leather seat and early hard rubber tires is estimated at €3000-5000 in Adam’s sale on April 17. 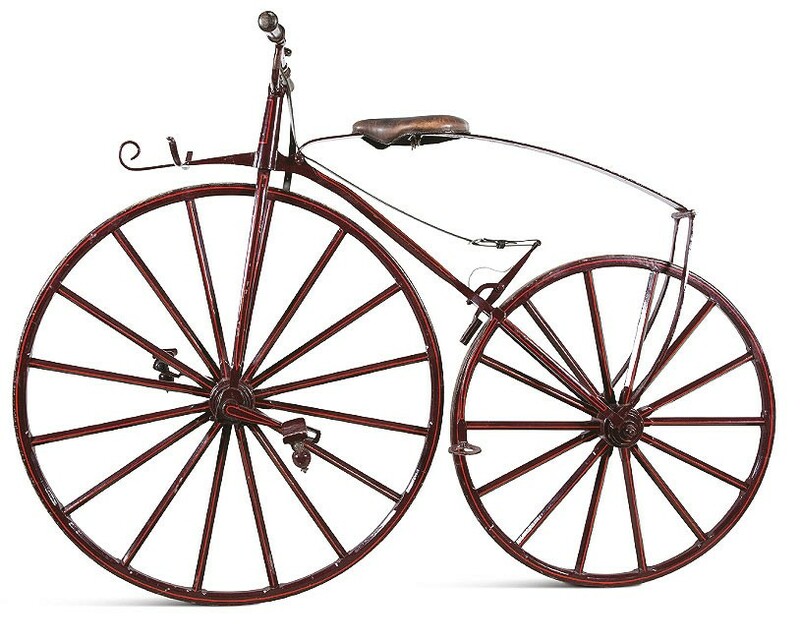 An 19th century ‘bone shaker’ bicycle of metal construction with a padded leather seat and early hard rubber tires is estimated at €3000-5000 in Adam’s sale in Dublin on April 17. Early pedal-driven bicycles were made from iron and wood that not only made them extremely heavy to manoeuvre but provided little forgiveness to their rider. Thus, the nickname ‘bone shaker’ was coined. Hard rubber tyres, seen on this example, were introduced in 1868 but did little to relieve their rider. It was not until 1888 that pneumatic tyres were invented by Belfast veterinarian JB Dunlop, paving the way for a more comfortable, swifter and enjoyable ride. View the auction online at thesaleroom.com. This sampler, embroidered to the bottom Ann Castle finished this in the year of our Lord 1811, is estimated at £200-300 at Plymouth Auction Rooms on April 17. The Georgian house depicted on this child’s needlework sampler above is believed to be Holly Cottage, a Grade II-listed property on the Wargrave estate in Berkshire. 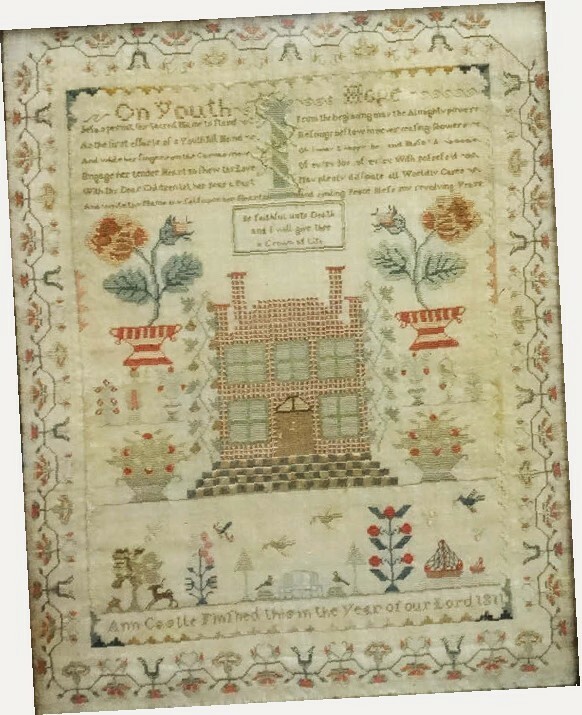 The 18 x 12½in (45 x 32cm) sampler, embroidered to the bottom Ann Castle finished this in the year of our Lord 1811, is estimated at £200-300 at Plymouth Auction Rooms on April 17 in Devon. According to the Plymouth family who have consigned it for sale, it was gifted to their grandparents who worked at Wargrave Manor and on their retirement lived nearby at Holly Cottage. The sampler shows the middle top window of the house intact before it was bricked up during the Georgian period to avoid paying window tax. View the auction online at thesaleroom.com. The emphasis will be on Modern British art in a 246-lot auction of British and Continental pictures on April 17 at Olympia Auctions in London’s West Kensington, with works by Augustus John, John Bratby and Laura Knight among others. 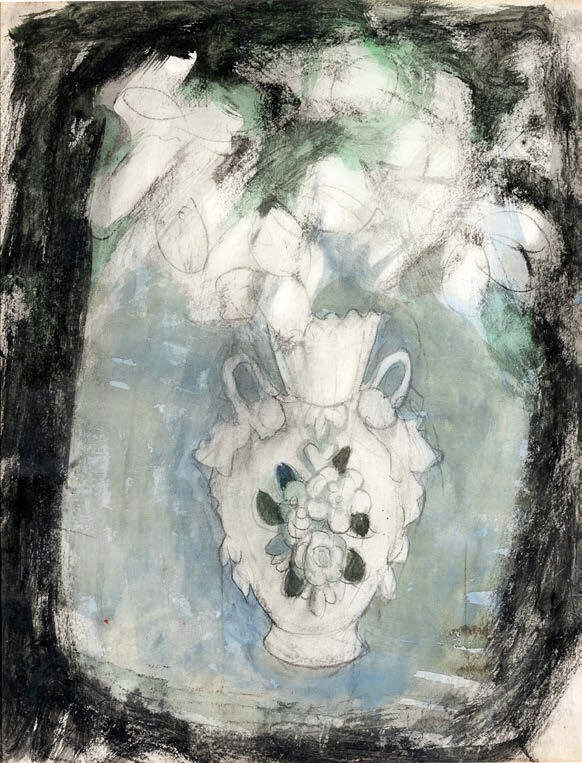 Flowers in a White Vase by Scottish artist Anne Redpath (1895-1965) is estimated at £4000-6000. The 18 x 14in (37 x 27cm) watercolour is typical of the artist’s use of white paint and flat-surfaced interior arrangements, where familiar household objects like cups, jugs, teapots, and flowers are disconcertingly displayed on tilting table-tops. View the auction online at thesaleroom.com.